A Gaza lawmaker plans to get Hamas, the PA, and the EU to work together to circumvent Israel's blockade with an international seaport. A Gaza lawmaker plans to involve Hamas, the Palestinian Authority, Greece, and the European Union in a plan to rebuild an international seaport and open Gaza's shores. 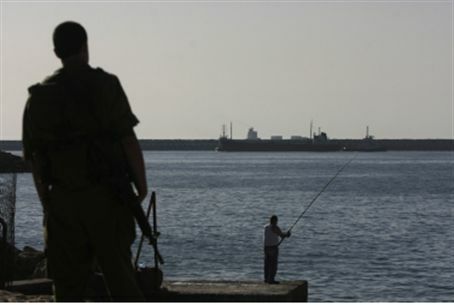 Israel, which has imposed a naval blockade on Hamas, has not been included in planning the project. Jamal al-Khoudary, who sits in Gaza's Hamas-run parliament, spoke to the Bethlehem-based Maan news about his plan. Besides being a Gaza politician, Khoudary is also active in organizations that seek to break the Israeli blockade of Gaza. Under Khoudary's plan, a rundown Gaza seaport would be rebuilt and opened to international shipping and traffic. Greece and the PA would sign an agreement for Greece to collect goods to be shipped to Gaza. EU monitors would be responsible for checking ships' cargo and ensuring that no new items are taken on board prior to each ship's arrival at the Gaza port. While he touted his plan as a way of linking Gaza to the outside world, Khoudary also openly stated that he hopes to leave Israel unable to enforce naval security – a violation of past agreements between Israel and the PA. Khoudary plans to “bring about the goal of ships breaking the siege... The intifada of ships will continue,” he stated. The plan has already been presented to PA Chairman Mahmoud Abbas, Hamas head in Gaza Ismail Haniyeh, and Egyptian President Hosni Mubarak, he said. French Foreign Minister Bernard Kouchner said last week that the EU would be willing to check cargo on Gaza-bound ships. EU monitors used to be responsible for monitoring the Rafiah crossing between Gaza and Egypt, but fled during the 2007 Hamas takeover, and have not taken an active role in monitoring crossings since.